Find or arrange a vertical flat piece of glass, or plastic (if you are using glass be careful to arrange it securely, so it doesn't break). Put a candle either side of the glass, and arrange it so that the rear candle is under the reflection of the front one. Light the front candle. What does it look like? 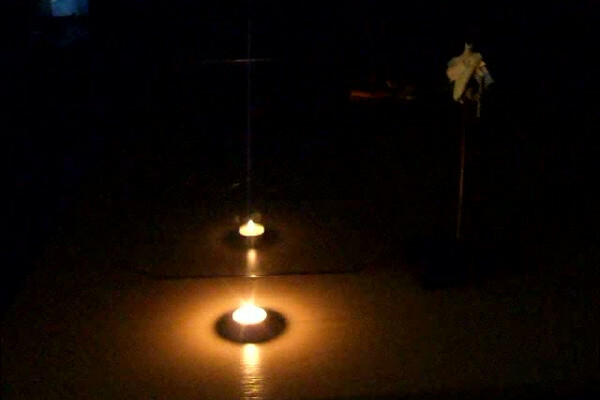 You should find that it looks like both candles are alight, until you look around the side of the glass. Although glass is mostly transparent, it reflects a significant proportion of the light that hits it. Normally the light going straight through is so much brighter that you can't see it, but if you use something bright, like a candle, in front of the glass and a dim room behind, the reflection can dominate what you are seeing. Glass reflects a proportion of the light that hits it, but most goes straight through This means that the reflected light looks like it is coming from the candle on the other side of the glass. So you see the reflection really well. The neat thing about reflections is that they look as if the object is behind the mirror. So when you move your head, the reflection moves in exactly the same way as the candle behind, so the illusion works from lots of directions. The illusion still works from different directions, because the reflection appears as if it were on the other side of the glass, so will stay superimposed on the candle behind. You don't have to just use a candle, a bright screen like the one on a mobile phone works too. This is how aircraft heads up displays work - the pilot has useful information superimposed on his view of the world, and so he doesn't have to look away when he wants to know his altitude. What has this got to do with theatre? You don't have to use a mobile phone screen or a candle, you could use an illuminated actor. Then you would get a ghostly, semi-transparent apparition reflected in the glass, that could "interact" with the other actors. This was a favorite of Victorian theatres, and was called Pepper's Ghost. Very interesting experiment indeed. Now I like to discover more about pepper's gost effect used in theatre. BESIDES I will set this experiments for my grandchildren.